Rayon is the oldest commercial manmade fiber. It is a manufactured fiber composed of regenerated cellulose, as well as manufactured fibers composed of regenerated cellulose in which substituents have replaced not more than 15% of the hydrogens of the hydroxyl groups. Rayon fibers include yarns and fibers made by the viscose process, the cuprammonium process, and the now obsolete nitrocellulose and saponified acetate processes. Generally, in the manufacture of rayon, cellulose derived from wood pulp, cotton linters, or other vegetable matter is dissolved into a viscose spinning solution. The solution is extruded into an acid-salt coagulating bath and drawn into continuous filaments. Groups of these filaments may be made in the form of yarns or cut into staple. The drawing process applied in spinning may be adjusted to produce rayon fibers of extra strength and reduced elongation. Such fibers are designated as high tenacity rayons, which have about twice the strength and two-thirds of the stretch of regular rayon. An intermediate grade, known as medium tenacity rayon, is also made. Its strength and stretch characteristics fall midway between those of high tenacity and regular rayon. The process of manufacturing viscose rayon consists of the following steps mentioned, in the order that they are carried out: (1) Steeping, (2) Pressing, (3) Shredding, (4) Aging, (5) Xanthation, (6) Dissolving, (7)Ripening, (8) Filtering, (9) Degassing, (10) Spinning, (11) Drawing, (12) Washing, (13) Cutting. The various steps involved in the process of manufacturing viscose are explained below. The swollen alkali cellulose mass is pressed to a wet weight equivalent of 2.5 to 3.0 times the original pulp weight to obtain an accurate ratio of alkali to cellulose. The pressed alkali cellulose is shredded mechanically to yield finely divided, fluffy particles called "crumbs". This step provides increased surface area of the alkali cellulose, thereby increasing its ability to react in the steps that follow. The alkali cellulose is aged under controlled conditions of time C) in order to depolymerize the°and temperature (between 18 and 30 cellulose to the desired degree of polymerization. In this step the average molecular weight of the original pulp is reduced by a factor of two to three. Reduction of the cellulose is done to get a viscose solution of right viscosity and cellulose concentration. Side reactions that occur along with the conversion of alkali cellulose to cellulose xanthate are responsible for the orange color of the xanthate crumb and also the resulting viscose solution. The orange cellulose xanthate crumb is dissolved in dilute sodium hydroxide at 15 to 20 °C under high-shear mixing conditions to obtain a viscous orange colored solution called "viscose", which is the basis for the manufacturing process. The viscose solution is then filtered (to get out the insoluble fiber material) and is deaerated. The yellow crumb is dissolved in aqueous caustic solution. The large xanthate substituents on the cellulose force the chains apart, reducing the interchain hydrogen bonds and allowing water molecules to solvate and separate the chains, leading to solution of the otherwise insoluble cellulose. Because of the blocks of un-xanthated cellulose in the crystalline regions, the yellow crumb is not completely soluble at this stage. Because the cellulose xanthate solution (or more accurately, suspension) has a very high viscosity, it has been termed "viscose". The viscose is allowed to stand for a period of time to "ripen". Two important process occur during ripening: Redistribution and loss of xanthate groups. The reversible xanthation reaction allows some of the xanthate groups to revert to cellulosic hydroxyls and free CS2. This free CS2 can then escape or react with other hydroxyl on other portions of the cellulose chain. In this way, the ordered, or crystalline, regions are gradually broken down and more complete solution is achieved. The CS2 that is lost reduces the solubility of the cellulose and facilitates regeneration of the cellulose after it is formed into a filament. Bubbles of air entrapped in the viscose must be removed prior to extrusion or they would cause voids, or weak spots, in the fine rayon filaments. Production of Viscose Rayon Filament: The viscose solution is metered through a spinnerette into a spin bath containing sulphuric acid (necessary to acidify the sodium cellulose xanthate), sodium sulphate (necessary to impart a high salt content to the bath which is useful in rapid coagulation of viscose), and zinc sulphate (exchange with sodium xanthate to form zinc xanthate, to cross link the cellulose molecules). Once the cellulose xanthate is neutralized and acidified, rapid coagulation of the rayon filaments occurs which is followed by simultaneous stretching and decomposition of cellulose xanthate to regenerated cellulose. Stretching and decomposition are vital for getting the desired tenacity and other properties of rayon. Slow regeneration of cellulose and stretching of rayon will lead to greater areas of crystallinity within the fiber, as is done with high-tenacity rayons. 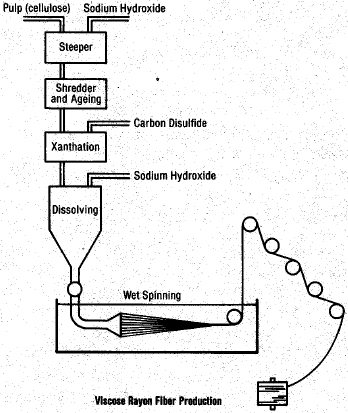 The dilute sulphuric acid decomposes the xanthate and regenerates cellulose by the process of wet spinning. The outer portion of the xanthate is decomposed in the acid bath, forming a cellulose skin on the fiber. Sodium and zinc sulphates control the rate of decomposition (of cellulose xanthate to cellulose) and fiber formation. Elongation-at-break is seen to decrease with an increase in the degree of crystallinity and orientation of rayon. The rayon filaments are stretched while the cellulose chains are still relatively mobile. This causes the chains to stretch out and orient along the fiber axis. As the chains become more parallel, interchain hydrogen bonds form, giving the filaments the properties necessary for use as textile fibers. The freshly regenerated rayon contains many salts and other water soluble impurities which need to be removed. Several different washing techniques may be used. If the rayon is to be used as staple (i.e., discreet lengths of fiber), the group of filaments (termed "tow") is passed through a rotary cutter to provide a fiber which can be processed in much the same way as cotton .